When Annai Maniammai was unanimously elected the President of Dravidar Kazhagam after Periyar’s demise, she willingly accepted it, deeming it her bounden duty to carry on his mission without any gap, and she proved herself amply worthy of Periyar’s trust and that of his followers, continuing that ‘tour programme of Periyar’ not only with meetings and functions but also with struggles, which had become a significant part of the organization’s agenda. A spectacular event that followed was ‘Ravana Lila’ conducted at Periyar Thidal on 25th December 1974. Periyar had left some notes expressing his intention to burn the effigy of Rama in retaliation to the annual affair of burning the figure of Ravana that took place in Delhi. It had been considered a supreme act of insult to Ravana, who symbolized the valour and the grandeur of the Dravidians. Since repeated pleadings had not prevented the government at Delhi from going on with the obnoxious ritual, Periyar wanted to teach them a lesson. It was essential because the burning, which is a religious ritual, is customarily attended by the President, the Prime Minister and the Ministerial Colleagues throwing secularism to the winds. 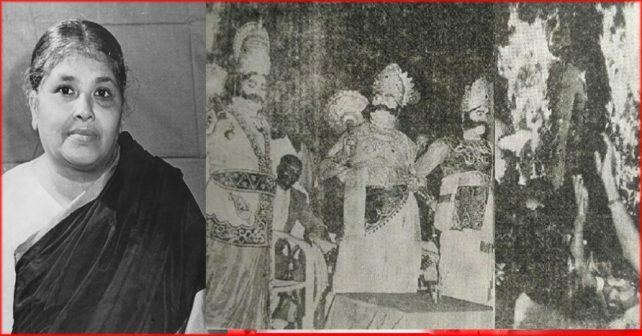 Going through Periyar’s notes, Annai Maniammai decided to conduct Ravana Lila in Chennai, to shock the rulers of Delhi into the realization that they could no more belittle the Dravidian race and get away with it. The decision was received by heart-felt cheers by the Black Shirt cadre. On 17 October 1974, Asiriyar Dr. K. Veeramani, the General Secretary of Dravidar Kazhagam, wrote a detailed letter to Prime Minister Indira Gandhi reminding her of Jawaharlal Nehru’s view that Ravana and the Vanaras were the rulers of the South and the Ramayana represented the fight between the Aryans and the Southern leaders, requesting her to put an end to the celebration of Ram Lila, and warning her that if the plea was not conceded the Kazhagam would be forced to celebrate Ravana Lila in order to safeguard the honour and Self-Respect of the Dravidians. Indira Gandhi’s reply was ambiguous and evasive, utterly lacking in the sensitivity that was expected of the Prime Minister of the country. And Ram Lila went on in Delhi as usual burning the figure of the scion of the Draividian race. After all the efforts at an honourable place failed, Annai decided that it was time that our mettle was shown to Delhi. Though she was in the hospital at that time, she gave a clarion call to the party men to get ready for the unique celebration. As usual volunteers jubilantly prepared themselves. Letters expressing solidarity with the Dravidian cause were received from different parts of India, including Uttar Pradesh. Annai Maniammai approached them accompanied by the three Dravidian heroes of yore and set fire to Rama, Lakshmana and Sita to the lusty cheers of the gathering, accompanied by crackers and fireworks. When the police came to arrest her Annai surrendered happily. Was she not heir to Periyar, the famous (notorious?) jail bird? Brahmins started giving petitions to the Governor and the Government of Tamil Nadu demanding a ban. There was a call attention motion in the Parliament. The entire country was shaken, yet the opponents were unrelenting. On 17 December, Annai as the President of the Dravidar Kazhagam, announced her determination to go ahead with the struggle and reminded everyone to maintain utmost discipline instilled in them by Thanthai Periyar. She was of course, anxious that the surging feelings of the party men should be kept within bounds. Though she respected the last minute appeal of Chief Minister Kalaignar, she was firm in her resolve to go ahead with the celebration. The Government of Tamil Nadu took the General Secretary along with seven of the dignitaries into preventive detention. News of the arrest spread among the ocean of people gathered in the venue and created a festive mood. Soon there arose shouts hailing Periyar, showing their dedication to their cherished cause. At the appointed Government the function started with great expectation among the gathering. Annai presided over, and party veterans expressed their dedication to the cause and loyalty to their leader, Annai Maniammai. In the afternoon, minutes before the launching of the struggle Annai declared that even at that late hour, if only there came an assurance from the other side that Ram Lila would be stopped once for all, she would withdraw the planned struggle. Otherwise, she thundered, Ravana Lila would go on. Three well built party functionaries attired as Ravana, Kumbakarna and Inderjit stood on the dais in all their majesty, reminding the onlookers of the spectacular glory that was lost. At about 7 p.m. the figures of Rama, Lakshmana and Sita were erected at the centre of Periyar Thidal. Even they exhibited good workmanship. When the police came to arrest her Annai surrendered happily. Was she not heir to Periyar, the famous (notorious?) jail bird? There was not a single untoward incident when she was taken by the police. Nothing other than loud cheers hailing Annai was heard. The entire incident from its inception to the end was a proof of Annai’s excellent qualities of leadership and the esteem in which the party cadres held her.